A wonderful essay in The Atlantic by Daniela Blei reminded me of a couple of experiences I had as a graduate student..
Blei describes being in graduate school, holed up in the library, cramming for her exams where she rehearsed her talking points. She had been given a long reading list of books which would serve as the basis for her oral exam, one that was to show mastery of the field the books represented. Blei purchased "a lifetime supply of index cards" (4 x 6) on which she wrote major points. 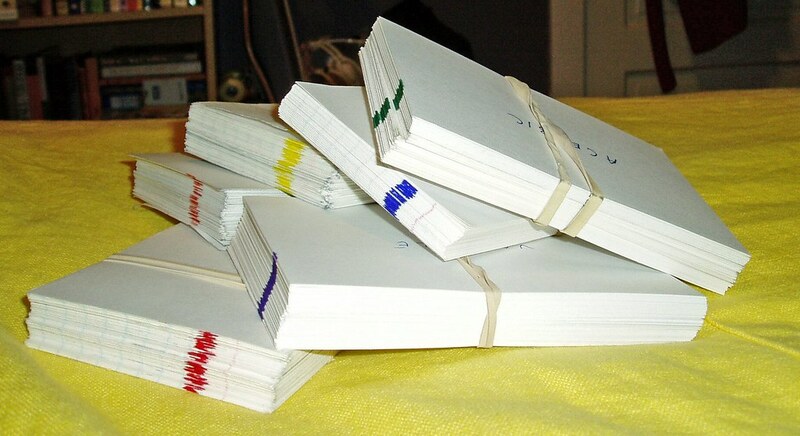 "My index cards," she writes,"--portable, visual, tactile, easily rearranged and reshuffled--got me through the exam." I never did this but in my prelims I knew I'd face a professor (feared but fair) who came with a large stack of index cards (3 x 5) on which were written questions about general biology. These were part of a large collection of several hundred well-shuffled cards. To prepare I read two or three basic biology texts a few times. I still have one of those texts because I liked it so much and because it is so well written. I passed, in fact did well but then I was fond of general biology. My written pre-lims took a much different turn. In consultation with a new professor-an up-and-comer--we settled on a large area related to my work, including some recommendations on readings but this list was not complete. The general topic was grasslands. We met once or twice while I was reading to talk about that literature and to see where I was going with it. The day arrived and I sat down to write for several hours. I was stunned when I opened the envelope. None of the questions had much, if anything to do with the ecology and evolution of grasslands. I did as well as I could and to my great surprise, I passed. However, I was both angry and disappointed with the professor. I got "even" later when he wasn't granted tenure. Ah, what schadenfreude! Thinking about it now still makes me smile. I have no idea of where he went or how he turned out as researcher and professor. I hope he became a fairer professor but have doubts. I don't know whether people still know what index cards are. I know that they are still sold. I found many uses for them over the years. Quick reference notes. Notes/summaries of seminars. Aids in classification. And so on. Blei notes that "the index card was a product of the Enlightenment, conceived by one of its towering figures: Carl Linnaeus, the Swedish botanist, physician, and the father of modern taxonomy." In 1767, as his career was ending, Linnaeus, began using "'little paper slips of a standard size' to record information about plants and animals. According to the historians Isabelle Charmantier and Staffan Muller-Wille, these paper slips offered 'an expedient solution to an information-overload crisis' for the Swedish scientist. More than 1000 of them, measuring five by three inches, are housed at London's Linnean Society." I hope you can find time to read Blei's essay about managing information, a possible inspiration for Linneaus's use of paper slips and the "checkered history" of this information storage and retrieval system. The text described above was Life: An Introduction to Biology: Second Edition. It is now so dated that it is not a reliable guide to general biology. It was written by the distinguished paleontologist George Gaylord Simpson and William S. Beck. It was a "principles based" approach. Simpson was a English major as an undergraduate, a good one and it shows. What a pleasure to read.